The several Ice Ages swept back and forth across Britain between about 450,000 BC and 8000BC. The vegetation here varied from little or nothing during the Ice Ages to Tundra conditions - moss lichen, possibly with stunted birch trees. It was the very edge of possible human life. Palaeolithic people - Homo Sapiens (modern man) and Homo Neanderthalensis (Neanderthal man) - were nomadic hunter-gatherers. They were in Britain in the Interglacial period, tools and so on have been found. By the end of the Ice Ages; about 8000BC there was an established human population across Britain of mobile hunter-gatherers, who would have hunted and gathered through Berwick parish, probably camping by the river and moving to follow seasonal foods. Open birch forests had developed. The rise in sea level lead to the formation of the English Channel between 7500 -7000BC. The warmer weather meant that the oak elm, pine and hazel forests around here and over Salisbury Plain were becoming increasingly dense. These species of trees indicates a depth of soil on the downs far greater than now. The Mesolithic people probably moved on a seasonal basis which makes their settlements difficult to trace, but these temporary settlements would have concentrated in the river valleys - like the Till - where there would be the widest variety of natural food resources. Their tools were of bone, flint stone and wood, none, as far as I know, from Berwick, but who knows what might be around. There was small scale clearance of woodland leading to the Neolithic, resulting in a patchwork of clearings by 4000BC. The move from hunter-gathering to a more settled life with domesticated livestock was gradual , and the social structure became more evident. And they had pottery! The first clues about humans in Berwick appear now. The woodland clearance that had started in the Mesolithic continued both in the valleys and on the hills. This led to considerable soil erosion that has meant that a lot of archaeological evidence in the valleys has been buried - sometimes up to 10 metres deep! The woodland was oak, elm lime and other deciduous species. The group (or groups) who lived in Berwick Parish became more settled in recognisable territories. Long Barrows like that in the “Lake Group” right on the south eastern corner of the parish are said to be “territorial statements”. They were not burial mounds - some Long Barrows have multiple burials in them, and some none at all. In the middle Neolithic more communal monuments were built, like the cursus at Stonehenge. The turn to cereal production was continuing but slow, most of the land around Stonehenge - and the work done reaches right to the Devizes Road (A360) and so includes a small bit of Berwick Parish - shows clearance to grassland for domestic cattle and pigs. In the later Neolithic all this developed more - with earthwork enclosures. The camp in Stoke parish by Yarnbury castle is probably Neolithic too. At the end of the Neolithic in Britain the pyramids at Giza were built. The early Bronze Age was a transition time from mainly pastoral to static cereal producing with major social changes which are not fully understood. These social changes meant that the large communal monuments (enclosures long barrows etc) ceased being built and barrows now covered the burial site of a very powerful individual now buried with grave goods including metal items. There were lots of these round barrows scattered over the landscape, many disappeared under ploughing, most around here as a result of the Government ploughing orders during World War II. In Berwick the barrows are a Bowl Barrow still remaining, and another which is just a crop mark now. The settlements and small square “celtic” fields had developed from the early Bronze Age, until they covered a great amount of the landscape. Berwick was part of a working landscape. Large earthworks were built, including the “ditch and bank” running along the eastern boundary of the parish. This ditch and bank can be traced over 2 miles and apparently marked defined territories between groups and suggests that land shortage was becoming a real problem in some areas. The boundary continues as the parish boundary to the present day. It links with a Bronze Age village and extensive field system in Winterbourne Stoke parish. The field systems marked on the map would have started in the Bronze Age. These celtic fields were small and rectangular being the first truly intensive use of the chalk for cereal growing. 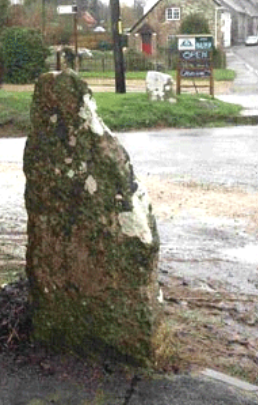 A “celtic” saddle quern (for grinding grain for flour) was found by Druid’s Head just in Stapleford. The higher land, cultivated for hundreds of years by now, had become poorer and shallower. Field systems had spread over most of the parish and several settlement sites have been found. There is no doubt that these field systems extended into the valley too - it is just that subsequent use, building, farming etc - has wiped away all traces, or they are buried beneath the soil eroded from the downs. South and east of Yarnbury (that is in the far east of the parish) there are 600 acres of field systems which include parts of other parishes and the famous “Cow Down” in Steeple Langford. Field systems have been found in Berwick Parish, and these are; the area west of the iron age village on Berwick Hill Farm, reaching toward Yarnbury, another which may well be part of the Cow Down system in Stapleford and part of the 280 acre field system around Druids, and on the boundary with Winterbourne Stoke. Caesar was amazed by the extent of cereal cultivation and referred to Southern Britain as a “land of gold”. Historically, this is where Yarnbury Castle would fit. But I have included it after Roman Times so it can be done in one go. ROMAN TIMES AND ROMANO-BRITISH from AD 43. The Iron Age became Roman Times with the Invasion of AD 43., and with it the imposition of the Roman Culture. The Romano-British are the same celts who lived here, fought the Romans at Yarnbury and lost, and who continued the Iron Age field systems, and lived in the Romano- British settlements. It may well be that Berwick and Asserton villages started as Romano-British settlements - or perhaps earlier - and later developments and soil migrating from the slopes having covered all traces. By 47AD England was Roman from Humber to the Bristol Channel. There is little direct evidence of the Romans in Berwick, except in Yarnbury, but life in Berwick Parish would have still revolved around agriculture, possibly with problems made by having to supply the Roman Army. The activity in and around Yarnbury is an example of, and is evidence of what was probably going on all over this area. Berwick Parish did not exist in a vacuum. There were lots of field systems overlapping the parish boundaries, Neolithic, Bronze Age and Iron Age features abound all over South Wiltshire, and further afield. Yarnbury Castle is a multiphase, multivallate plateau type hillfort of 28.5 acres (11hectares). It is one of the largest and best preserved hillforts. It is 525 feet above sea level on the upper chalk at the south end of a level spur. The nearest water is at the River Wylye by way of a dry valley to the south west - a walk of about 3 kilometres. The Castle has a large inner rampart, which was revetted at the front, and ditch with a massive counterscarp bank, a ‘V’ shaped gap and a smaller second rampart and ditch, and is generally well preserved. The overall width of the defences is a uniform 55ft. There is an elaborate inturned entrance at the east, with an impressive ‘D’ shaped outworking to prevent direct approach to the entrance, and a small enclosure outside the ramparts on the west. The Castle now has seven breaches in the defensive circuit. The site seems never to have been ploughed since it ceased to be inhabited. FIRST PHASE. EARLY IRON AGE c300 BC. The first rampart and ditch were built in about 300 BC, dated from pottery in the lowest levels. The entrance was on the west, it was a gateway with wooden gates (there are gatepost holes remaining) and a flint made roadway 16feet wide. The ramparts were reinforced with wooden revettments which were probably higher than the bank to protect the sentries on the top of the bank. It is thought that this inclosure was built over several years. This “hillfort” was one of many lightly defended large hill top settlements developed because of steadily growing population living in permanent areas. The crops and cattle used all the available land, so battles raids etc were a necessary part of survival of the tribes. It is thought that warriors were the ruling class and therefore put defence first. Things settled down and the first defences were allowed to deteriorate, and the bank was flattened. The Atrebates Regni and Catuvellanuni were “Belgae” tribes and became well established in the South East - warring amongst themselves as well as against the native Celts. The second Phase at Yarnbury was the building of the much more impressive defences by the native celts against the Belgaeic tribes. Two extra ditches and ramparts were added around the original enclosure to make the defensive circle much larger. The new entrance was also strongly fortified. It was now 28.5 acres and the castle we know today. The Castle was built to repel attackers who used sling shots, flaming brands etc and who would attack a gateway to try to set fire to it, and to undermine any walls etc. Sling bullets have been found, made of chalk, pebbles and baked clay. The use of sling shots meant that the higher and wider defences of the new Castle were now necessary. These later fortifications were probably added very quickly. Work done at Ravensburgh hill fort suggests that 200 people could build a similar hillfort in 3 or 4 months, less if a whole tribe helped. This included the cutting and preparation of the wood needed for the revetting. Almost certainly it developed into a market place, perhaps a religious centre, and certainly a lot of people lived there, judging by the number of holes found. Before the Romans came it was a city - that large, and that important ! Yarnbury Castle is associated with many acres of field systems and at least one Romano-British village situated outside the hillfort. The Castle was lived in and around for a long time. The whole of the inside of the castle shows remains of structures including over the earlier enclosure, making use of the shelter afforded by the hollow. The intensity of the occupation inside is shown by over 130 structures surviving mainly as hollows up to 1m deep. Most are circular 7 - 15 metres diameter many being set within compounds or yards. On the north and east between the earlier castle and the inner rampart, a number of large compounds containing structures are visible with stone footings of buildings within many of them. All these structures were not here at the same time - rebuilds and changes happened over the years. As well as the structures, pits probably contemporary with the occupation have been found in many areas. One of these pits is lined with clay and has slab of Chilmark stone at bottom, still watertight 2000 years later. THIRD PHASE ROMANO-BRITISH AD 43. The Atrebates - to the East of our Area - were Belgae. The Durotriges - us! - were one of the original “celtic” peoples. Yarnbury was a large city on the eastern edge of Durotriges territory - a very important place. Many Belgaeic tribes had begun to abandon their hill forts but in Durotriges and other celtic areas they remained fortified until the very bitter end. When the Romans invaded in 43 AD many of the Belgae tribes in the south “welcomed” them. But “our” Durotriges violently opposed the invasion. In 43 - 44AD Vespasian, a future emperor, was sent with the II Augusta Legion to subdue the south and south west. Details of the campaign are scant but by the end he had subdued right down to Exeter and had captured 20 “oppida” and/or hill forts - Yarnbury was one of those. Hill forts were like Medaevil castles - extremely good defence until a new form of warfare is invented - in the castles case it was cannon - for hillforts it was Romans different method of warfare - siege mainly! Who were the Romano-British? They were the native celts - new name, but same people. Once the Romans had taken over, and it was no longer defensively necessary to live in and around a hillfort, it is a wonder that people stayed. But they did stay. Yarnbury, unlike some other hillforts, was not abandoned. The defences were not renewed, but neither were they slighted. A stock enclosure was added to the outside of the ramparts on the west and a break was made in the defences to get into it from the Castle. Roman (Samian) and Belgaic (wheel-turned) pottery has been found, as have Roman coins. Little excavation has been done in or around Yarnbury but several infant skeletons have been found, and the burial of a tall young man in Roman hob-nailed shoes. Two “celtic” women buried here show their lives were hard and unpleasant - they had very bad teeth and terrible arthritis. The farming continued and people lived up on the downs at least for another 150 years. It had been an important place and probably continued as such. There was probably a gradual drift away, once it was no longer necessary to live in such an inconvenient place without water and very windswept. But this would have taken quite a long time, as it is not easy to abandon your home and change your lifestyle. Apparently no one has lived at Yarnbury after the 3rd century AD. Yarnbury had been inhabited from the Iron Age until the middle of the Roman Occupation (at least) - possibly 500 years! The land around, of course, was not abandoned, but continues in agriculture to the present day. Eventually Yarnbury became a sheep fair ground. When this happened is not known - it had, after all, been a market since probably before 300BC! How long the break between the Romano-British centre and the mediaeval sheep fair was, is not known - for all we know there may have been no break at all! There are seven opening in the ramparts. One is original, the second Romano-British, and the remaining five relate to downland droveways, a number of which converged on the Castle. In the south east quarter of the hill fort are the remains of the Sheep Fair, an event of uncertain age, held every other year until 1916 on the 4th October. The limits of the fair are marked by 6 boundary stones. The northern line is the Steeple Langford Berwick St James parish boundary. This means that the actual fair took place in Steeple Langford Parish. The sheep folds are 16 low mounds arranged in 2 blocks of 8 in a rectangular area 120m by 90m. These were the latest folds and are probably 19th century. In the 18th cent the fair was run by the tenant of Steeple Langford farm. In 1771 Mr John Swayne had a 6 year lease from Lady Chedworth for the Yarnbury castle Fair. At the Fair of Tuesday 4th October 1836 at “Yarnborough Castle Fair - a report in the Salisbury Journal said that Ewes and Wethers had a very heavy sale, Lambs 16s to 22s, only a shilling short of Wilton. “It was, in its heyday one of the most important sheep fairs in the west of England. But it was a hopeless place to reach by any method of transport, save Shanks pony and even then you had to be prepared for a stiff climb” Quote from Peter Gurney “Shepherds Lore” 1930. The Fair was closed in 1916 when the surrounding area was commandered by the army for troop training. After the War it moved to Wylye where it shrank until it was closed, and combined with Wilton Sheep Fair. Yarnbury was used by the Army. In Feb 19th 1898, it was reported that the manoeuvres would take place in September with about 50,000 soldiers and the first engagement would be at Wylye then battles at Wishford and Yarnbury Castle. Yarnbury Castle is now used for sheep grazing and is unimproved grassland supporting many wild flowers. It is privately owned.